It's the day after St. Patrick's Day and over the course of the last 24 hours I've been scanning how people around the world (particularly in the United States) celebrate the day. It still quite amazes me that a country the size of Ireland has managed to influence the world to Go Green once a year. It's sort of baffling, actually. I mean: the world doesn't have a day devoted to Italy once a year, does it? We don't all tank up on Spaghetti and pitchers full of Chianti and raise a glass to some Italian saint none of us have heard of, do we? The world doesn't celebrate George Washington Day once a year nor toast the good health of King Richard III or become teary-eyed when reminiscing the French Saint Albaud of Toul. Nor do governments insist on the once a year display of their favourite monuments in garish yellow lights to commemorate a complete foreigner. As I say, the global breadth of Saint Patrick on March 17 every year still baffles me. It is unique and therefore somehow thrilling. But...what I find even more baffling are the various ways some of my American friends and acquaintances celebrate the day. Based on what they say, they truly believe their celebratory adventures are in keeping with the traditions of Ireland. And while I don't mean to burst anyone's bubble many of these practices are completely foreign to the Irish. So I thought a short list was in order: things that most Irish simply will not do on Saint Patrick's Day...and what they actually get up to. It is St. Patrick's Day, not Patty's Day - oh how many times have I heard folks name the day after a Patricia I've never heard of? It's PATRICK'S Day. Not Paddy's Day or Patty's Day or anything in between. Drink Green Beer - which is an absolute sacrilege. Most beer drunk in Ireland on this day of days is black. It's called Guinness. Drinking green beer is heretical. The Irish have died for less. Drink Beer in Pitchers - pitchers do not exist in Ireland. Beer comes in pint glasses. It also comes in 'a glass' - that is, when you want a 1/2 pint of beer over here, you order a Glass of beer. Good beer also comes in tins (cans) but it is drunk that way in the summer months only and out in the back garden. On St Patrick's Day, beer is drunk by the pint and nothing less will quite do. Eat Anything Unnaturally Green - in Ireland on St Patrick's Day we are not allowed to buy and eat Green Bagels. We don't eat: green potatoes, green biscuits (cookies), or green ice cream (other than Mint which is perfectly acceptable). The Irish do eat green cabbage but that's because it comes that way. Dye Rivers Green - on St Patrick's Day the Irish do not Dye the Shannon River green. Nor the Liffey River, though the Liffey often looks green anyway. Nor any other inland waterway. If it's not naturally green - if a body of water is pink for instance - it's just going to have to stay that way over the Patrick's Day week. Dye Bits and Pieces of Their Bodies Green - though some here may embrace this practice, most don't. Hair or other body parts are not dyed green. Period. Eat Corned Beef and Cabbage for Dinner - in all my years here I don't think I've ever heard of an Irish person eating Corned Beef for dinner. On St Patrick's Day, many will have Bacon and Cabbage, but do not confuse 'Bacon' with fried bacon strips which many Americans have for breakfast. Here, Bacon is a cut of pork, a fine lump of meat much like ham. Boil it up for hours, serve with boiled cabbage and boiled spuds, and voila! But on St Patrick's Day the Irish may also eat: duck, beef, Chinese Take-Away, lamb and many other items. Ideally, these are all washed down with vast quantities of Guinness. Dress Their Children Up Like Leprechauns - here we don't need to dress our kids up like wee little people. Leprechauns can be found in glens and forests. We prefer the real kind and don't want to mislead our children into thinking they can spin beer into pots of Gold. Go to Mass - it's a Saint's Day, right? It's our day of national celebration, also correct? Which means many of us go to a Mass of thanksgiving on this day. Particularly because in Ireland it's a holy day of obligation and we'll be damned for all time if we don't go. Drown the Shamrock - many Irish give up the dreaded drink for the 40 days of Lent. But: Lent ends only at Easter. On the 17 of March, Easter is still weeks away which means technically those of us who have promised to abstain still should. But - we have a secret weapon. On St Patrick's Day the Irish embrace an unauthorised day of absolution. Which means Lent or no Lent, many will drink like fishes. Attend the Parade - on St. Patrick's Day, it seems every little town and village has their very own St Patrick's Day Parade. These are small, often rural, affairs. Parades are often created from: tractors, ambulances, the local Garda Siochana, children dressed in all sorts of bright attire, local school bands whether they can play or not, the local landed gentry riding large horses, and the drunken rabble who pour out of local pubs to watch. Invariably it rains on St Patrick's Day which means we all clutch hot whiskey's in our mits while trying not to look miserable. Wear Shamrock - shamrock is real. It's a wee little 3-leafed plant that is absolutely glorious. 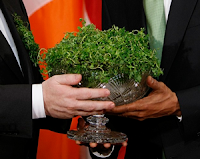 Only 2 days ago, our great Taoiseach (Prime Minister) gave a bowl of this magical stuff to the current President of the United States who apparently didn't understand the significance of it all and possibly tossed it down the toilet. 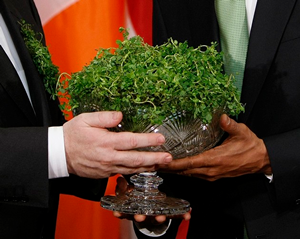 The Irish don't get bowls of Shamrock. Instead, we pick it and pin it to our clothing. Within an hour or two the greenery dries up and dies but it is wonderful while it lasts. Go to the Local Pub - related to Drowning the Shamrock (above), going to the Local is a tried and tested tradition. What's more: all are welcome. Whole families show up including crying children, bored teenagers, and parents intent on enjoying themselves despite the wails of their infants. Going to the Local Pub is obligatory on St Patrick's Day. Go Back to the Local Pub - I should explain that many make an initial trip to the Local following Mass or the Parade, with families in tow. After that, most retire home for dinner (see comments on Bacon and Cabbage above). After that, and perhaps after an hour's nap if one is so lucky, some sneak back out to enjoy themselves at the Local until the wee hours. Sing and Dance - if you're lucky, your Local will also have brought in a Traditional Group. Often consisting of a fiddler, Bodhran player, pipes if you're fortunate, accordion or squeeze box player, a fellow on guitar, and a man or woman with a lusty voice, drunken local folk will sing along until the band stops playing - or even longer than that. Or - climb on a plane and come here to experience a real Irish St Patrick's Day yourself. Happy St Patrick's Day everyone - even if it's a day late. And here I was all proud of myself because for the first time in my life I actually made corned beef and cabbage. I should have stuck with hamburgers and hot dogs! Haha! Least yer heart was in the right place.